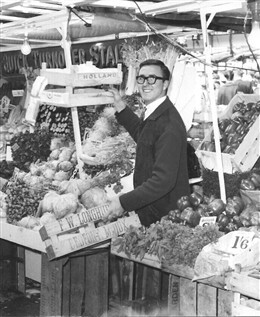 The Sewell family business of street trading was run by my granddad Tom Sewell Snr. along with my Nan Beattie, my mum Eileen and Uncle Tommy. They started out selling salad and seasonal fruits. I can remember helping out on Saturdays and in the summer holidays, also at Christmas time when they sold Christmas trees. 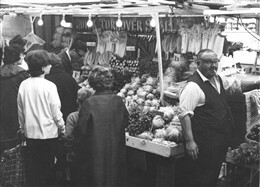 Over the years many members of the family worked on the stall it really was a family business. Tommy Sewell was one of my Dad's best friends and they used to go fishing together. My Mum wouldn't buy fruit from anyone else. My Dad was Reg Turner, he worked for the Council Public Health Department and we lived in Lisson Grove. Tommy Sewell was one of my Dad's best friends. They used to go fishing together. My Dad was Reg Turner and we lived in Lisson Grove. My Mum was Marjorie. Does anyone remember them? My great grandad started this market. My grandad sold it many years ago. All sadly passed away.My grandad was Albert Jennings, married to Eleanor (Nell) Jennings.